Important note: Be sure to get a USP certified Food Grade glycerin. Some glycerins are TOXIC and should not be consumed. Rinse and sort cranberries removing any that are soft or discolored. Put good cranberries in a pot and bring to a boil over high heat. When berries start to pop, turn down heat to medium and let simmer for 10 minutes. Carefully press hot cranberry mixture through a fine mesh sieve into a bowl. This will make a cranberry gel. Chill the cranberry gel. You'll only need 6 tablespoons of it later. Beat eggs with hand mixer on highest speed until light and fluffy. Mix Swerve or Truvia and Xanthan Gum together. Sprinkle into eggs while beating on highest speed. Eggs will thicken slightly. Add salt, 6 tablespoons cranberry gel and liquid sucralose. Freeze in an ice cream maker according to manufacturer's instructions. Nutrition: Note I have no way to determine the nutrition info on the cranberry gel, but it's less than a teaspoon of gel per serving. It may add a carb or so to what's listed below. 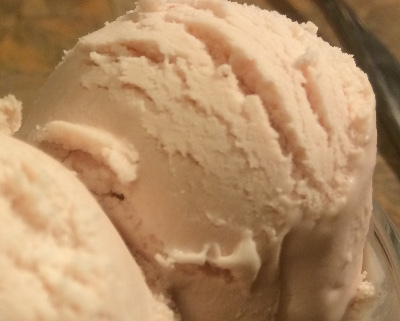 For more great low-carb ice creams and more information on how to make low-carb ice cream in general check out Gerard Pinzone's Blog. He's the man with the science.